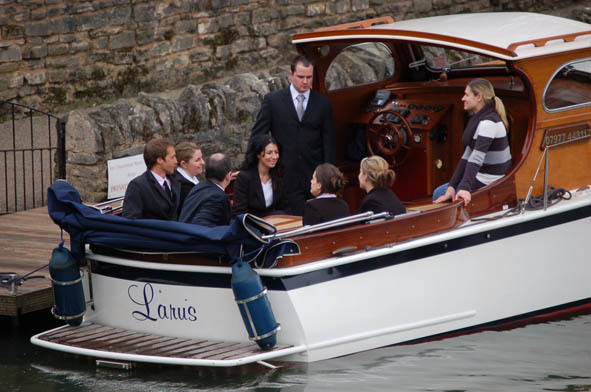 Boat Hire in Windsor, Larus - Luxury River Boat for Hire near Windsor, Eton, Dorney and Datchet on the River Thames. Welcome to the Windsor page of our website. If you are looking for a beautiful cruise on the River Thames then this is just what you are looking for! Catering for up to 12 people on our luxury boats we can also accommodate groups of up to 36 by using a second, or third vessel. Keep reading for an idea of what you might see during a 2 hour trip, or click here to see what else we have on offer. The River Thames is of course the reason for the existence of the Castle and hence the town of Windsor. During your cruise the helpful crew will point out many points of interest including the best view of the Castle, offering a perfect photo opportunity. From The Thames it is possible to appreciate its strategic location, as passing down through Romney Lock the river flows around The Home Park, the private part of The Crown Estate. During a typical 2 hour cruise we are likely to start by heading upstream from central Windsor, taking in the abundance of wildlife on the meadows of Eton and in the Thames itself. As we pass under Brunel's bridge, the oldest wrought iron bridge still in service, Windsor Leisure Centre comes into view on our Port side (Left) and the Relief road crosses the river in front of us, linking the town to the M4 and Slough. As we leave the centre of Windsor behind the River meanders around Windsor Racecourse, famous for it's Monday evening meeting. For more information on our race nights please click here. Boveney lock is now just minutes away, and during a 2 hour cruise we may continue upstream towards Bray or turn here and proceed downstream. Downstream we pass through Romney Lock, soon to be the site of the first hydroelectric trial on weirs. At this point The Jubilee River, a flood defence channel as large as the river and 10 miles long, starting in Maidenhead just above Boulter's Lock rejoins the Thames. We then sail under The Albert and Victoria	Bridges, before returning to our embarkment point in the heart of Windsor. 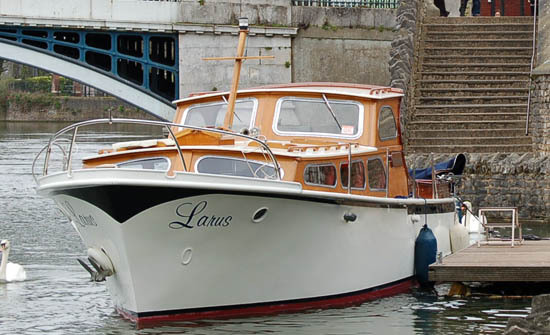 Larus is based in Windsor and cruises between Maidenhead and Runnymede passing through Windsor and the Home Park past Windsor Racecourse, Windsor Castle, Dorney and Bray. She offers boat hire by the hour and is very popular for Birthdays and Anniversaries amongst family groups. Available for transportation to one of the many riverside restaurants/hotels why not book in at Sir Christopher Wrens House Hotel, House on the Bridge, Monkey Island, The Brasserie at Bray Marina or Browns. Alternatively Larus can be enjoyed as a venue for a picnic lunch, dinner, afternoon tea or simply sightseeing.